Then America meets Prince Maxon. Gradually, she starts to question all the plans she’s made for herself – and realizes that the life she’s always dreamed of may not compare to a future she never imagined. I honestly could not put down The Selection once I started reading it, which was a surprise to me because before I’d laid my eyes on the inside of the novel, I couldn’t bring myself to pick it up. 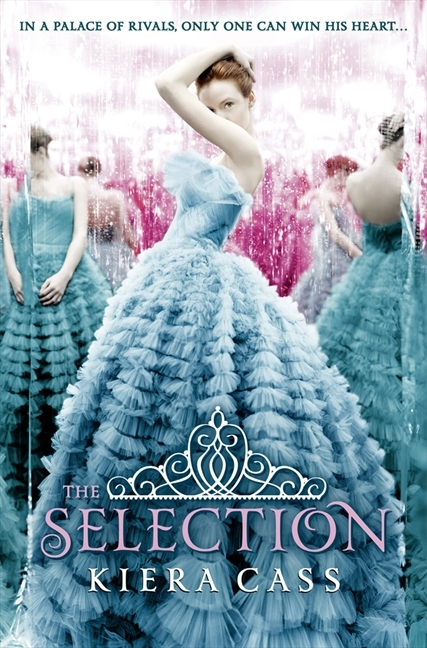 I had seen The Selection in bookshops many times and, while the gorgeous cover always caught my eye, it was the pinks and blues that put me off buying The Selection because I thought it would be too girly and young for me. This is a classic example of why you should never judge a book by its cover. I fell in love with The Selection and its characters right away. I was right, it is girly, but unashamedly so. It made me feel young, but at the age of 23, I didn’t feel that I was too old to be reading it. It was refreshing. It gave me butterflies and made me anxious, and provoked other emotions in me at all the right times. I’ve read books that make me feel disconnected and nonchalant, but The Selection had me turning the pages like my life depended on it. America is one of the most likeable characters that I’ve ever come across, and I thoroughly enjoyed following her journey as she left her family, her secret love and her beliefs behind to fight for the love of a Prince she doesn’t want to marry. It’s hard to explain the concept without it sounding like it’s going to be a bit of a rubbish read, but it’s done in a way that’s clever and engaging. It’s got those dystopian elements that are so popular right now, what with the futuristic setting and the new way of living split into a class-like society, it’s got the threat of a rebel attack that could put the lives of hundreds of people at risk, and it’s got a romantic storyline that is dominant but not overpowering. There are several factors that help me make the decision to give a book a 5 star review. The first is whether I read it quickly, which I did. The second is whether I’m enjoying it enough to sacrifice my morning train nap in order to read it, which I did. The third is whether my best friend Zara enjoys reading it as much as I do, because we have quite conflicting opinions about books sometimes but if we both love it equally I know it’s a good’un. And guess what, she loved it! I was worried that she wouldn’t, because I’ve seen lots of bad reviews of this book on Goodreads, but she and I both decided that we need to get the sequel as soon as possible (the fourth sign that a book deserves 5 stars). I would love to know your thoughts about The Selection. Are Zara and I alone in our love for this book? Will I love the sequel as much as I loved the first instalment? Let me know in the comments section below or on Twitter.